Scotch purists may baulk at the thought of adding ice or mixers to their single malt, but what about another whisky altogether? Matt Evans charts the Scotch whisky hybrids exploring flavour through Bourbon, Irish or even Japanese blends. 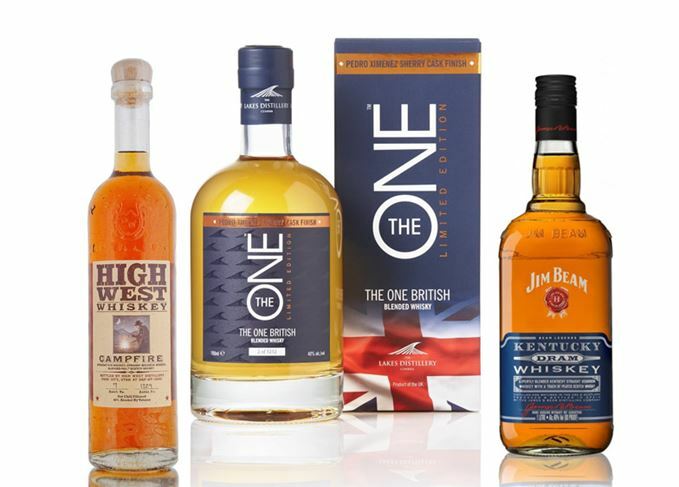 Last week, Cumbrian distillery The Lakes announced the imminent launch of what it called the ‘world's first’ blend of Scotch and English whiskies. While they could be seen by some as a drastic abandonment of Scotch whisky’s sacrosanct nature, hybrid whiskies – blends of two or more different whiskies from different countries of origin – are not altogether new, nor is Scotch whisky’s role in them. Hybrid whiskies are perfectly legal – although they cannot be labelled as Scotch – prompting several producers both home and away to play about with various flavour combinations that are arguably unattainable using whisky from a single country. The results have been fascinating and have generated debate over whether they threaten Scotch’s integrity. Below is the story of The Lake’s innovative creation Steel Bonnets, along with eight other Scotch whisky hybrids from recent years. For this trip around the whisky world, you won’t even need a passport. Ahead of the launch of its first single malt next month, the Lakes distillery is set to release an Anglo-Scotch hybrid whisky on 9 July. Named after the moniker used for the Border Reivers that harried the Scottish-English border in the 13th century, Steel Bonnets is made from the distillery’s own single malt, alongside ‘some of the most respected malts from Scotland’, and is billed as the ‘world’s first’ blend of Scotch and English whisky. Appropriate, considering that the distillery itself is about 35 miles from the border. The One, produced in 2013 under the watchful eye of former Macallan whisky maker Dhavall Ghandi, combines Scotch, Irish, English and Welsh whiskies, and is labelled by the Lakes as the ’one and only British Isles blended whisky’. Said to have a ‘slightly smoky, sweet and fruity’ palate, the recipe has been kept under wraps – although due to the limited pool of English and Welsh whiskies, savvy whisky fans could make an educated guess as to which distilleries contribute to the blend. ‘One morning at the Bruichladdich distillery B&B, High West Founders David and Jane Perkins smelled peat in the air...’ That’s how the High West marketing team introduce Campfire, the distillery’s blend of Bourbon and rye, combined with peated Scotch. Despite the reference to Bruichladdich, the source of the peated malt remains strictly confidential, although the American whiskies hail from the vast Midwest Grain Products (MGP) plant of Indiana. With all the whiskies involved ranging from five to eight years old, High West Campfire is a young blend said to be ‘long, sweet, spicy and smoky’ on the palate. Whiskies used: Scotch and Japanese (The Glover), Scotch and Indian (The Kincardine; The E&K), Scotch and Dutch (The Winter Queen). Produced by: Adelphi and Fusion Whisky Ltd. Distiller and bottler Adelphi partnered with Fusion Whisky Ltd, a small Edinburgh enterprise, to create a series of limited edition blended malt whiskies honouring lesser-known historical figures with Scottish roots. The first hybrid created by the partnership in 2015 was The Glover, named after Thomas Blake Glover, a merchant known as ‘the Scottish Samurai’. Initially released as a 22-year-old – there have since been a further three iterations – the whisky is a blend of roughly 65% malt from Hanyu in Saitama, Japan, 35% malt from Longmorn in Moray and 1% malt from Glen Garioch in Aberdeenshire. Only 390 bottles were released at £1,050 each. Adelphi and Fusion Whisky followed up with The Kincardine in 2016 and The Winter Queen earlier this year. The Kincardine was a blend of Glen Elgin, Macallan and India’s Amrut, created to honour Victor Bruce, the 13th Earl of Kincardine and Viceroy of India from 1894 to 1899. This was followed by the release of The E&K, another Scotch/Indian blended malt featuring liquid from Ardmore, Glenrothes and Amrut, matured for five years and with an 800-bottle run. Meanwhile, The Winter Queen is a blend of whisky from Longmorn and Glenrothes distilleries in Scotland, as well as malt whisky from Zuidam in the Netherlands. It was created to celebrate Elizabeth Stuart, the daughter of King James VI of Scotland and Queen Anne of Denmark. Whiskey Union was established in 2015 as the innovation arm of Scotch heavyweight Diageo, responsible for products such as the hop-infused Boxing Hares, and Huxley Rare Genus, a blend of Scotch, Canadian and American whiskies. Launched in 2016, Huxley’s label depicts a ‘mobsprey’, a mythical animal comprised of parts of Scottish, Canadian and American wildlife. The recipe itself is kept confidential, apart from confirmation that the blend contains both malt and grain. Initially rolled out across the German bar scene, Huxley is still available at specialist retailers, priced at about £30. Created by previous Bruichladdich owner Murray McDavid in partnership with Ireland’s Cooley distillery, Celtic Nations was a blend of single malts from both. Bottled in 2006 and marketed as a ‘Celtic blended malt whisky’, it quickly drew the attention – and ire – of the Scotch Whisky Association, which promptly ruled the term ‘Celtic malt’ illegal. With a few bottles in circulation, the now discontinued blend occasionally pops up online on whisky auction sites. In 2012, the fledgling Teeling Whisky Co, created by the former owner of Cooley, released Hybrid Malt Whisky No 1 Edition, a blend of 10-year-old Bruichladdich and Cooley created from the left-over stock of Celtic Nations married in casks for a further eight years. Waste not, want not. Bourbon powerhouse Jim Beam entered the hybrid whisky fray in June 2015 with Kentucky Dram. The limited edition product was a blend of Bourbon from its Kentucky distillery with ‘a touch’ of lightly-peated Scotch single malt from Ardmore distillery in Aberdeenshire. The expression was released as a no-age-statement blend under the Jim Beam brand as a travel retail exclusive, simply labelled as a ‘Kentucky Dram whiskey’.